Quite a celebration has been planned for next weekend in my hometown, Grant City, Missouri, in commemoration of its founding 150 years ago, in February 1863. The town was named after Ulysses S. Grant, a Union solider in the Civil War who was stationed in Missouri when President Lincoln appointed him to be a brigadier general in August 1861. Grant then fought a series of successful battles and was promoted to major general in 1862. But while people in Grant City will be celebrating its sesquicentennial, people in other parts of Missouri are remembering the terrible devastation of their houses and other property 150 years ago this month—just as the people of Lawrence, Kansas, recently remembered the destruction of their town on August 21, 1863, as I wrote about in my previous posting. 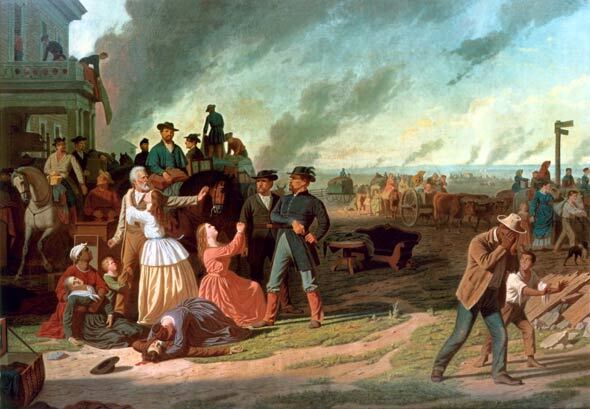 As a direct result of the Lawrence Massacre, and in an effort to defuse the “border war,” General Thomas Ewing issued Order No. 11 on August 25. That order resulted in the burning of most of the rural houses and crops of the Missourians who lived in Cass and Benton counties and parts of Jackson and Vernon counties. That was the area adjacent to the Missouri-Kansas border from the southwestern part of Kansas City to north of Nevada. Even though Bingham also served as a Union soldier, he was appalled by the consequences of Order No. 11, which Ewing did execute. That resulted in much of those four counties being destroyed by fire, and the area came to be known as the “Burnt District.” The population of Cass County, for example, was reduced from 10,000 to 600. And in 1868 Bingham did paint a picture depicting the sad consequences of Order No. 11, which became the title of the painting. On August 17, June and I went down to the River Market area of Kansas City and saw the reenactment of the issuance of Order No. 11. That took place across the street from Pacific House, the very building that was the headquarters of Ewing after he was promoted to brigadier general in March 1863 and given command of the District of the Border, which was comprised of Kansas and western Missouri. A small print of Bingham’s famous painting hangs on the wall in Pacific House now. People of power never seem to learn, though. The terrorist attack of 9/11/01 spawned retaliation on Afghanistan, and the ongoing war on terrorism now conducted increasingly with drones and causing the death of non-terrorists, women and children as “collateral damage” continues to spawn anger toward the U.S.
Thankfully, the March on Washington led by King 50 years ago next Wednesday (Aug. 28, 1963) recognized that reconciliation is better than retaliation. I wish the “bushwhackers” and “jayhawkers” had recognized that in the 1850’s and ’60s. And I wish the President and the U.S. government had recognized that in 2001, and would even now recognize the futility of retaliation and the urgent need to work more diligently for reconciliation. This entry was posted in Uncategorized and tagged Bingham (George Caleb), Civil War, Ewing (Thomas), Missouri (Burnt District), Order No. 11, reconciliation. Bookmark the permalink. There are additional details of history that perhaps can reinforce your point that violence begets more violence. If we were able to interview James Lane he might try to justify his 1861 raid on Osceola as retaliation for the first sacking of Lawrence in 1856. Probably the more immediate rationalization for Lane’s raid was that it was a tactical move behind Sterling Price’s Confederate advance into central Missouri to hinder his supply lines.